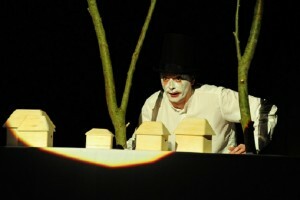 A new staging of Schubert’s Winterreise, co-produced by the German group Music Theatre Transparent and Ensemble Intercontemporain. Schubert’s cycle of 24 songs concerns the desolate winter’s journey of a mysterious, lovelorn wanderer, sung in this performance by Austrian baritone Georg Nigl and accompanied on the piano by Andreas Staier. Experimental Czech orchestra Berg perform at Prague dance venue Klub Roxy. The programme consists of Olga Neuwirth’s Lost Highway, soundtrack to the David Lynch film of the same name, and Die Stücke der Windrose by Mauricio Kagel, a composer known for providing players with theatrical instructions to follow as they perform. The concert is part of the 2016 Spaces Festival: eight events spread throughout spring and taking place in unusual locations, often combining other art forms. London-based artist Mira Calix hits the road with Moving Museum 35, a sound-art installation on a bus conceived in collaboration with students from Nanjing University of the Arts, China. Following bus route 35 in Nanjing, the ambulatory exhibition consists of 21 musical responses to a group of Abstract Expressionist paintings chosen by Calix. 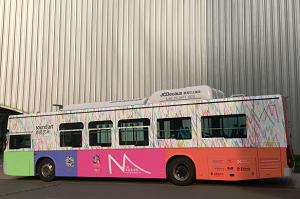 The bus itself, covered inside and out with the bright colours and abstract shapes of the original artworks, should prove alluring to Nanjing’s washed-out commuters. Smock Alley Theatre and the Contemporary Music Centre in Dublin play host to Music Current 2016, a newly conceived festival of contemporary classical compositions and Irish electronic music and video. The programme spans works for voice and film to a baroque chamber ensemble interacting with computer-mediated electronics. Icicle-loving percussionist Terje Isungset makes instruments out of ice that he gathers from the glaciers, lakes and rivers of his native Norway. 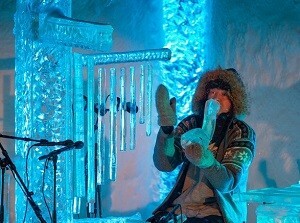 Harps, xylophones, digeridos and other instruments can all be fashioned out of frozen water to ethereal effect. Insungset’s musical influences range from Gamelan to folk music, Minimalism and even whale song. Here he gives an outdoor performance in Lærdal, Norway alongside singer and instrumentalist Maria Skranes. The Iceland Symphony Orchestra, conducted by Ilan Volkov, are joined by an international array of artists and composers – including Roscoe Mitchell, Peter Ablinger and Séverine Ballon – to perform eight new works. Conceived in Reykjavík, the Tectonics Festival has spread round the world and includes site-specific performances in Adelaide, Glasgow and Oslo. A selection of music from The Ridge, the new solo album from Sarah Neufeld, best known as the violinist in Canadian band Arcade Fire. A mingler among many genres, Neufeld counts Bartok, Reich, Iva Bittova and Arthur Russell among her influences, as well as contemporary electro-acoustic, avant-folk and indie rock. Ten new works for solo and electronic instruments created by students of composition and computer music training at IRCAM (Institut de Recherche et Coordination Acoustique/Musique) in Paris. Performed at the Pompidou Centre by musicians from the Conservatoire national supérieur de musique et de danse de Paris. The pianist Nils Frahm brings his band, Nonkeen, to a former pumphouse on the Spree for a concert meandering between classical, electronica and pop. The three band members have been experimenting with music ever since, as children, they mixed instrumental performances with playground noises and teachers’ voices. Part of the UM:LAUT series in Berlin presenting music in dialogue with other art forms. A film exploring the mysterious biography of Maurice Ravel, who in later years battled degenerative brain disease while being an internationally renowned artist. Director and author Christoph Werner has developed a dramatic musical work for puppets, actors and pianist Ragna Schirmer, who stages music during the work.